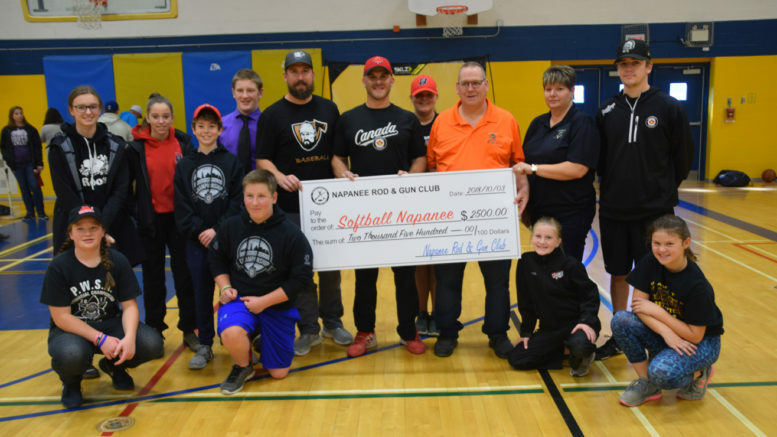 Team Canada junior coach Jeff Ellsworth (centre) accepts a cheque from the Napanee Rod and Gun Club’s Brian and Monique Calver to cover the costs of a softball clinic. Photo by Adam Prudhomme. Softball Napanee players had a unique opportunity to learn from some of Canada’s best inside the gym at NDSS. Napanee’s own Brendan Hagerman used his connections to bring national junior coach Jeff Ellsworth to town to help lead a hands on clinic for youths. Hagerman worked with Ellsworth this summer when he was selected as Team Canada’s catcher for the WBSC Junior Men’s Softball World Championship, held in Prince Albert, Sask. On the first day the clinic focused on hitting, while on the second they shifted to fielding drills. For Ellsworth, a native of P.E.I. who is touring Ontario hosting clinics and promoting his Exit Speed hitting training technique, he says he was impressed with the turnout to the event. “It just shows how passionate this community is for the sport of fastpitch softball,” said Ellsworth, who is also a member of the men’s national team and has represented Canada at the Olympics. Also assisting with the clinic was Nick Shailes, a member of Australia’s national fastpitch team. The clinic was open to both boys and girls. The young players will now have a chance to work on what they learned throughout the winter and could see it pay dividends when they return to the diamond next spring. Cost for hosting the clinic and renting space in the NDSS gym was covered by a $2,500 donation from the Napanee Rod and Gun Club. NRGC president Brian Calver said when the club was approached by Rick Normile to help cover some of the cost, every member of his club voted to cover the entire cost.